Day 1: AIA Sessions Friday, 6/22/ 7a.m.-7p.m. At Javits Center, NYC This Think-In is divided into two parts over two days: active engagement with relevant session at the AIA National convention to ensure substantive dialogues on professional issues on Friday, June 22; and Think-In panel discussions on Saturday, June 23 at Prime Produce that examine the theme of Infrastructure. Infrastructure is the network of systems necessary for an organization to function. When those systems are degraded enough, the defining functions of the organization fail. The Architecture Lobby has selected this theme for its first National Think-In to generate a way forward and rebuild our discipline’s infrastructure. Check this space for more details soon! The Regional Plan Association (RPA) has published a report that calls for major changes to how transit is operated between New Jersey and Manhattan. In 25 years, the report explains, daily commuters into Manhattan from New Jersey increased by 70,000 to 320,000. "Our current system of trains, buses, subways, ferries, and roads does not have enough capacity to serve another 72,000—let alone another 150,000," said the RPA. The report goes adds that while rail journeys from Penn Station have almost tripled, bus travel is where major growth has taken place, increasing by 83 percent. 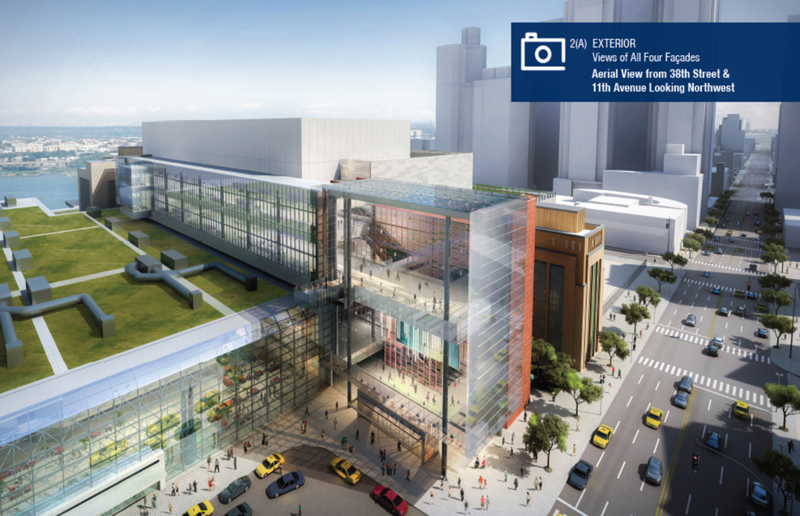 As a result, the RPA's biggest proposal is for a new Port Authority Bus Terminal (PABT) at the base of the Javits Center. This $3 billion project would not mean destroying the current PABT in Midtown, it said, but it would create an additional bus hub to relieve the Midtown terminus. "The ramps connecting the Lincoln Tunnel and the PABT are immovable and any solutions must keep them in place," the RPA argue. "Any other building site large enough for existing and expanded PABT operations will be enormously expensive; and any relocation will put the PABT passengers further from their destinations and the extraordinary subway connections they now enjoy." 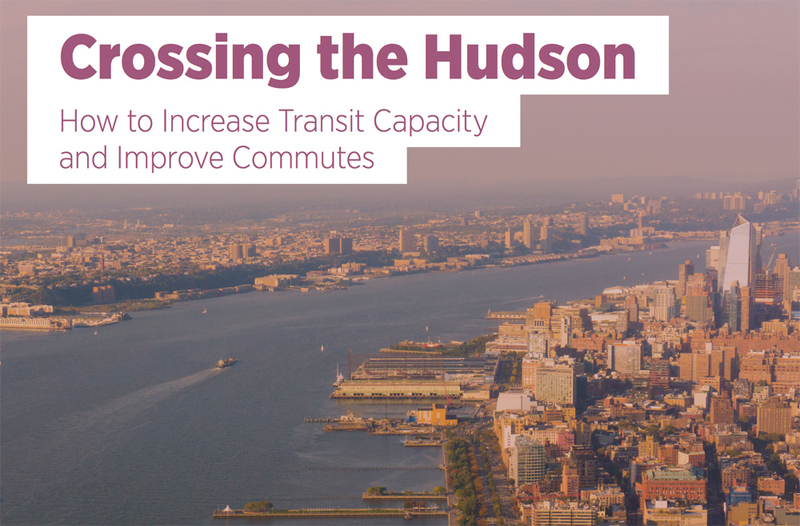 While having some bus routes into Hudson Yards is a good idea, access to the #7 train may not be adequate from a capacity perspective. Secondly, that train doesn't go anywhere useful for those coming into Manhattan—it's a line that primarily services Queens. The RPA, however, had other points to make, notably stressing the importance of the Gateway Project. "The new tunnels must be in place before the existing tunnels fail. Simply put, this is the highest infrastructure priority for the nation." Furthermore, the RPA called for Gateway to be turned into a through-running service, no longer terminating at 7th Avenue, but going onto Sunnyside Yards in Queens by going eastward under Manhattan. Planning consultants ReThink Studio also have a scheme similar to this. Keeping with rail travel, Vishaan Chakrabarti and PAU's proposal to move Madison Square Gardens to an adjacent site was praised by the RPA, creating what it called a "beautiful train station." All in all, this plan would be executed in phases. These phases were outlined and can be found below. The long-awaited addition to the Jacob K. Javits Convention Center now has a design-build team. 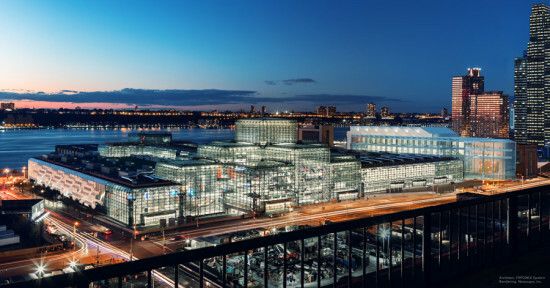 New York's Empire State Development (ESD) has selected Turner Construction and Lendlease, an Australian company, to design and develop a $1.5 billion expansion of the Javits Center, New York City's largest events space. Renovations will add 90,000 square feet of exhibition area, a 55,000-square-foot ballroom, 45,000 square feet of meeting rooms, an outdoor events pavilion that can hold up to 1,500 people, and a 6.75-acre green roof. In all, the new and old buildings will host a combined half-million square feet of exhibition space. ESD, the state economic development authority, owns the property, which hugs 11th Avenue between West 34th and West 40th streets on Manhattan's Far West Side. Crucially, improvements will re-route some 20,000 trucks off surrounding streets each year, a move that is expected to improve traffic and pedestrian flow in the immediate area. Faster loading and unloading will also free up 20 additional days for more events at what is now the United States' busiest convention center. When expansion plans were announced last year, Governor Andrew Cuomo pegged costs at around $1 billion, though later estimates moved that figure higher. The state will pay $1 billion of the total cost, and the rest of the project will be bond-financed. Tishman Construction (an AECOM subsidiary) is overseeing the first phase of work to ready the site for a new building. That work began in September 2016, though at this time, there's no set construction timeline for the project overall. As part of a package of proposals for his 2016 agenda, development on Manhattan's West Side will intensify. 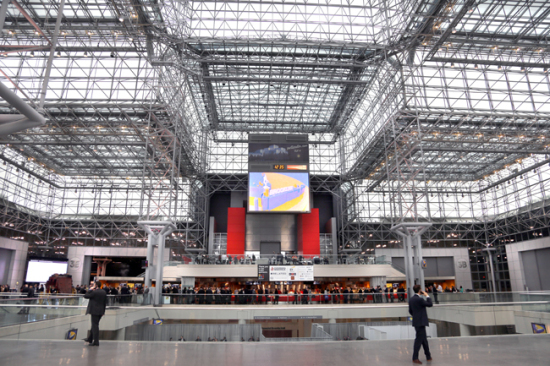 Governor Andrew M. Cuomo recently revealed a $1 billion plan to expand the Jacob K. Javits Convention Center. The expansion, designed by New York–based FXFOWLE, calls for adding 1.2 million square feet of event and meeting space, as well as a four-story, 480,000-square-foot parking garage to house the 20,000 or so tractor-trailers that bring event supplies to and from the venue each year. The Javits Center, between West 34th and West 40th streets along 11th Avenue, is one of the nation's busiest convention centers. The state estimates that the convention center generated $1.8 billion in economic activity in 2014. Cuomo's proposal would add 1.2 million square feet of space to the 2.1 million-square-foot venue, increasing its size by 50 percent. Upgrades include 500,000 square feet of uninterrupted event space, as well as a 60,000-square-foot ballroom. The parking facility will improve pedestrian safety by diverting trucks from the streets surrounding the Javits Center into a central delivery area with 35 loading docks. The venue is aiming to up its current LEED Silver certification to LEED Platinum with energy-saving upgrades. 2014 renovations added a 6.75 acre green roof, new flooring, and a new facade. A 34,000-square-foot solar energy array, the largest on any public building in New York, will be installed to complement these upgrades. Additionally, a terrace with a 2,500 person capacity will be built to take advantage of sweeping Hudson River views. Construction is expected to begin in late 2016. See the gallery below for more images of the planned renovations. The lead-up to New York State Governor Andrew Cuomo's State of the State address feels like a government-backed encore of "The Twelve Days of Christmas." Instead of lords a-leaping and swans a-swimming, Cuomo brings infrastructure upgrades a-plenty in his 2016 Agenda. The governor promised funds to the Gateway and East Side Access tunnels, the Javits Center, new Metro-North stations in the Bronx, the MTA (wi-fi a-comin'! ), and an airport on Long Island. Arguably the biggest proposal is the Empire State Complex, a $3 billion redevelopment of New York City's Penn Station and its surroundings. 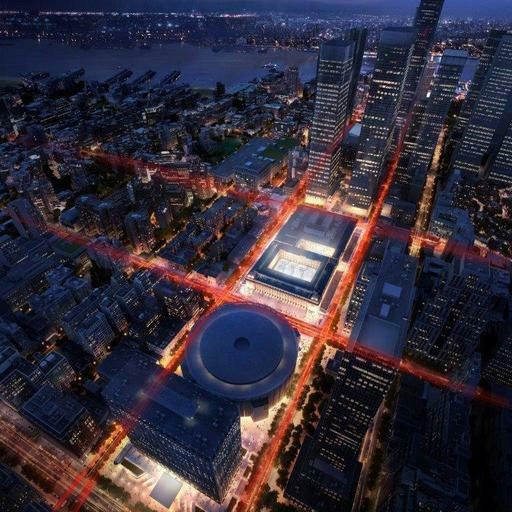 The plan seeks to make Penn Station, which sits beneath Madison Square Garden, less of a hellhole—nice, even. Built to accommodate 200,000 daily riders, the station now serves 650,000 people per day. Channeling public sentiment, the governor ripped on Penn Station in his announcement. "Penn station is un-New York. It is dark, constrained, ugly, a lost opportunity, a bleak warren of corridors. [It's] a miserable experience and a terrible first impression." The governor's plan calls for enhancing connectivity between the station and the street; providing wi-fi; and reducing congestion by widening existing corridors, creating better wayfinding, and improving ticketing areas. As hinted at in previous proposals, the massive, neoclassical James A. Farley Post Office, at Eighth Avenue between 31st and 33rd streets, could be converted into the "Moynihan Train Hall," a sun-drenched waiting area for Amtrak, Long Island Rail Road, New Jersey Transit, and MTA passengers. A pedestrian tunnel underneath Eighth Avenue will connect the train hall with the main station. With this 210,000-square-foot addition, the size of the station will increase by 50 percent. The governor reviewed possible redesign scenarios. In one, Madison Square Garden Theater would be demolished to make way for a block-long entrance to Penn Station, facing the post office. In another, a glassy entrance, with skylights, would be constructed on 33rd Street. The street would be closed and converted into a pedestrian plaza. A third, more minimal scenario would add entrances at street corners and mid-block. In 2013, the Municipal Art Society (MAS) hosted a competition to rethink Penn Station. MAS highlighted designs four firms—Diller Scofidio + Renfro, H3 Hardy Collaboration Architecture, SHoP Architects, and Skidmore, Owings & Merrill (SOM)—for an improved Penn Station. In addition to improved passenger flow, each proposal imagined the station as a civic hub and neighborhood anchor. The governor said that this would phase of the project would be completed first. The rest of the overhaul could be complete by 2019, an amazing feat in a city where infrastructure improvements can drag on for decades. The Empire State Development Corporation, the MTA, Amtrak and the LIRR will parter with private developers to spearhead the project. $2 billion will go towards the Empire State Complex, while $1 billion will go towards "retail development" on 7th and 9th avenues. $325 million is expected to come from state and federal governments. The rest of the project will be privately funded, in exchange of revenue generated by commercial and retail rents. Cuomo will be issuing invitations to private developers, with an April 2016 due date. Currently, Vornado Realty Trust manages land around Penn Station, though it's unclear whether this relationship will continue. Archtober Building of the Day #22 Jacob K. Javits Convention Center 655 West 34th Street FXFOWLE Epstein Designed by Pei Cobb in the early 1980s, the Jacob K. Javits Center had fallen into a considerable slump in the years following its debut. Plagued with structural problems, today’s Archtober tour leader and head of the building’s extensive overhaul, Bruce Fowle, began in the center’s Crystal Palace by showing photos of the space before his firm’s massive undertaking. He highlighted two of the worst features of the original structure—the dirty, impossible-to-clean glass and extensive water damage. Almost immediately after opening, large canvas “diapers” were constructed to catch the ever-leaking roof, costing the center nearly one million dollars a year to alleviate the constant influx of water. 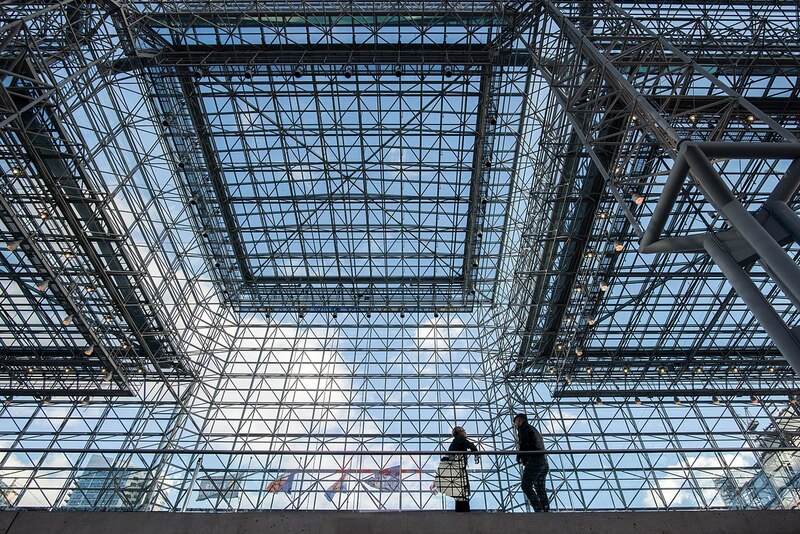 Bruce Fowle further explained that the original Javits' glass was too highly reflective, creating either a problematic glare or a dark, “Darth Vader” appearance. Later, the NYC Audubon Society identified the structure as the number one bird killing structure in New York City. To mitigate both the aesthetic and environmental problems with the existing glass, FXFOWLE Epstein reviewed many glass mockups before deciding to apply a “frit” or glazed dot pattern to the panes, reducing the avian death rate by 90 percent and giving the space a significant solar energy reduction. Another problem with the old structure was the fact that the original building plan did not include a viable way to clean much of the glass. As a result, some of the panes went without cleaning for more than twenty-five years. FXFOWLE Epstein solved this problem by installing catwalks throughout most of the Crystal Palace, both inside and outside of the building, so that repairs and cleaning could take place on a regular basis. As the tour proceeded to the North Concourse, Bruce Fowle pointed out the renovation to the concrete exposures. Cracked and yellowed after years of layering convention signage, FXFOWLE Epstein brought in experts to create a repair formula. The result was a ceramic material that brightened the concrete but allowed it to retain its original look. The tour concluded with a behind-the-scenes look at the new green roof. As the second largest green roof in the United States, tour participants happily traded a few very windy and drizzly moments for stunning view of the city and its surroundings. Looking toward the future, FXFOWLE Epstein has partnered with Drexel University to install a climate monitor that measures the roof’s water and soil content, and examines the impact of the roof on the building’s energy load. Future testing will determine how much FXFOWLE Epstein’s reimagining of the Javits will impact the ambient temperature in the entire neighborhood and possibly serve as a catalyst for green retrofitting for New York City’s future. Hit the books tomorrow with a visit to New York University’s School of Professional Studies! Rochelle Thomas received an M.A. in American Studies from Columbia University and is the Membership Assistant at the AIA New York Chapter.